In 1928 Aalto and his wife Aino won the competition to design a tuberculosis sanitorium near the Finnish city of Paimio. The project was not completed until 1933, and during this time they were also appointed to design the interior and furnishings. Initially they considered using the metal framed B3 (Wassily) leather chairs of Marcel Breuer, but it was decided that wood was a more suitable material in the atmosphere of the sanitorium, being warmer, more supple and generally friendlier towards the patients. Used in the patients lounge, the relaxed angle of the backrest was intended to help the tuberculosis sufferers breath more easily. 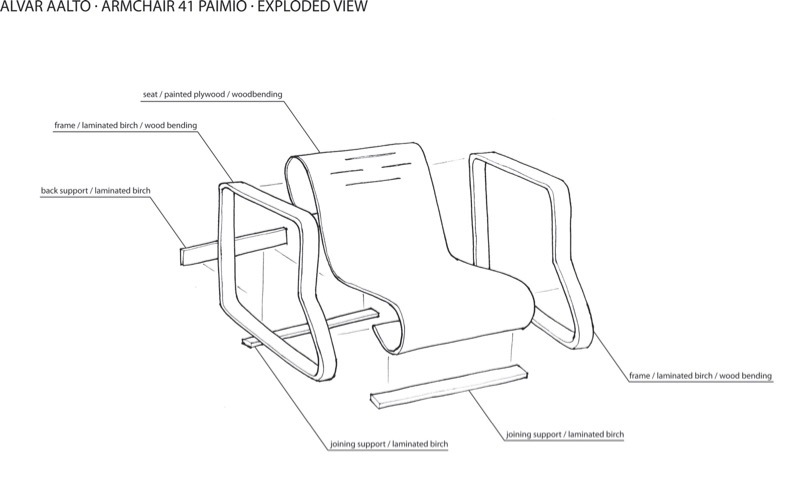 After a number of experiments with materials, laminated birch was settled upon as a material for the side elements and the one piece seat and backrest. This gave the chair a degree of flexibility and springiness. In 1935 the company of Artek was formed by Alvar and Aino Aalto to manufacture their designs, and Artek still produces this chair today. We have launch this 1:16 paper model in September 2016. We would like to say a big thank you to Alvar Aalto Foundation & Museum and Marianne Goebl of Artek for their kind permission to use the design in our product. The background of this paper model is influenced by Aalto’s architecture, of course, but this is not an existing room. Instead it is a mixture of two styles and eras. The narrow windows and roller blind are from the Aalto House (1936), and the interior colour is influenced by Studio Aalto (1955), both of which you can visit and walk around. The above pictured narrow windows for ventilation were typically showing Aalto’s attitude towards designing a house – plenty of light and a practical way of bringing fresh air into all of your rooms. 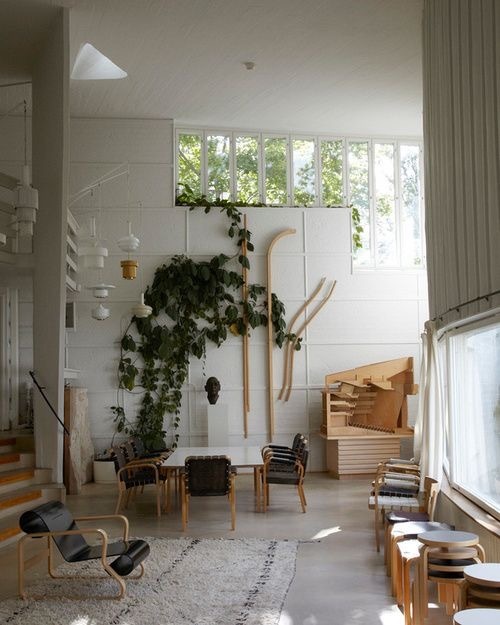 You could experience the architect’s creative way of live-work life if you spend your whole afternoon at the Aalto House, where he lived and also kept his studio for 19 years.